There are several career paths available to those interested in working at a veterinary office, and most of these options do not involve pursuing a veterinary degree. It takes the teamwork of the receptionist, office manager, kennel assistants, vet techs, and veterinarians to ensure that a veterinary clinic runs smoothly on a daily basis. The receptionist runs the front office of the veterinary clinic and is usually the first member of the staff to greet clients as they arrive with their pets. The receptionist is also responsible for answering calls, scheduling appointments, filing patient charts, entering data into computerized billing systems, and processing bill payments. The receptionist should be able to handle animals like dogs and cats while checking them in for their appointments. While a college degree is not necessary for this position, many receptionists have a degree in business or communications. However, many positions require at least one year of customer service experience and a high school degree or equivalent. Veterinary receptionist jobs carried an average salary of $25,000 to $35,000 in 2018 according to Indeed.com. The veterinary clinic manager is responsible for a variety of management tasks such as personnel management and shift scheduling, interviewing and training new hires, overseeing payroll, ordering supplies, and tracking accounts payable or receivable. The clinic manager will likely help organize and run programs as well as help with routine decisions for proper care of the animals. Clinic managers must be proficient in budget planning and cost controls. Clinics that have an office manager usually have increased profit margins, as vets can devote their full attention to seeing clients as opposed to dealing with business and personnel details. Clinic manager jobs carried an average salary of $35,000 in 2018 according to the Indeed.com with some as high as $45,000. A kennel assistant is responsible for the basic care of animals that board at the clinic, whether just for the day or for extended stays while owners are on vacation. Kennel assistants clean cages, walk the dogs, provide fresh food and water, bathe or groom dogs, and assist with general clean-up duties in the clinic. Occasionally a kennel assistant may be called in to help the vet or vet tech with procedures, administering medication, or changing bandages. The position of a kennel assistant is considered an entry-level position in the hierarchy of the veterinary clinic, so the pay usually starts near minimum wage for those without a great deal of experience. Individuals with more experience can command a higher hourly rate. Indeed.com shows that the majority of kennel assistants earn $15,000 to $20,000 per year. Veterinary technicians assist veterinarians with health care procedures in the clinic. The responsibilities for a vet tech usually include assisting with routine exams and surgeries, taking blood or stool samples, running lab tests, taking and processing x-rays, performing dental cleanings, updating patient records, cleaning and sterilizing equipment, and filling prescriptions. The primary difference between vet techs and vet assistants is that techs have completed a two-year associate degree and passed a national licensing exam. 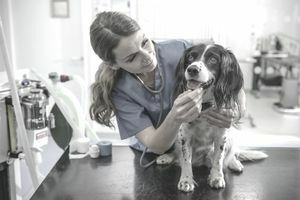 Veterinary assistants learn by gaining hands-on experience in the clinic and may not be qualified to perform certain duties in many states where licensing is required. The salary range for veterinary technicians was $25,000 to $35,000 in 2018. Wages for veterinary technicians can vary based on years of experience and specialty skills. Veterinarians working out of an office are generally small animal practitioners, though some equine and large animal practitioners also maintain offices and office staff. General duties for a veterinarian include giving routine exams, performing scheduled surgeries, evaluating x-rays, prescribing medications, suturing wounds, and giving immunizations. A degree in veterinary medicine requires a significant investment of time and money. Veterinarians usually complete their Bachelor of Science degree in three or four years before moving on to pursue a veterinary degree. Becoming a specialist requires even more practical and educational experience. The salary for veterinarians can vary based on the area of practice and specialty. Salaries for vets range from $80,000 to $100,000 and include private practice vets as well as those who work in an animal hospital setting. Practice owners and board-certified specialists tend to earn even higher salaries.